What can a consultant help with? 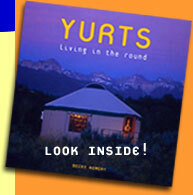 Sometimes just general questions having to do with the yurt buying process, or construction and appliance issues. Other consultants can help with more specific issues like building codes, answering questions and even facilitating the process. And finally, there are the experts who can help you and a group of friends erect a fabric yurt–or put together a frame panel yurt. The people listed below are not employed directly by a yurt company, though they may be recommended or certified by particular companies. I’m happy to answer general questions around purchasing or setting up your yurt and can help locate experts to assist with specific issues. Cost: $60/hour. Mark Benjamin, Crown Jade Design and Engineering, Inc. Specializing in architectural and structural plans for building permits and alternative building systems. Licensed in six states (AZ, CO, CT, NM, PA and WY) and available for national consulting.